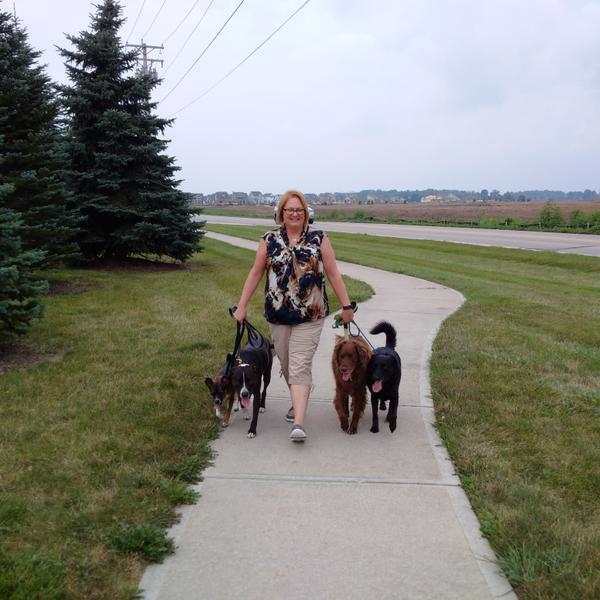 We called Andrew when handling our 2 dogs on walks became such an effort that we only walked them late at night or very early in the morning just so we would not encounter other dogs along the way. It became clear that we were only managing the situation instead of seeking help to make it better. Specifically, we our dog Zoey was very reactive when she saw other dogs which then made her brother Hershey’s pulling hard too difficult to handle, making it necessary to walk them individually. We wanted to be able to walk our neighborhood, greet friends and not be nervous about encounters. Within the first session, our Zoey was under control and Andrew had taught us techniques to encourage good behavior from our pups. The following weeks of training helped us fine tune our skills as their owners; focusing on our reactions in tense situations and how to alleviate not only the dogs’ stress, but ours as well. We are several weeks out from our training program and we have begun to receive compliments from our neighbors on how well behaved our beloved pups have become. We are so thankful to Andrew and the patience he showed not only to our pets, but to us as well! We would encourage anyone experiencing behavior issues to contact Andrew and to be assured that he will help guide you towards a peaceful experience for all!